We knew it was a matter of time before criminals misused what is supposed to be an innovation for efficiency and convenience. Makati City police arrested two college students Monday after seizing P1.5 million worth of party drug tablets. The students had used the popular mobile application Grab to get the “ecstasy” pills from one place to another. The app allows users to find a ride, order food, get errands done, or transport items. In this case, it was the Grab delivery driver who alerted police about what the students asked him to do. Seized from the suspects were 657 tablets of ecstasy, two bottles containing ecstasy, 42 tablets of suspected party drugs, six sachets of suspected party drugs, two digital scales, four lighters, 13 empty cigaret boxes, a glass tube, and a cellphone. This incident is a stark reminder that the drug menace does not reign only in hovels and squatter areas. It is not only the poor who resort to drugs in their desperation and misery. In the war against drugs we have seen how it is often the poor who are pursued and even killed if they so much as resisted arrest. The menace pervades all sectors of society. In well-off neighborhoods, for instance, those involved in the trade do not do so out of economic need or desperation. 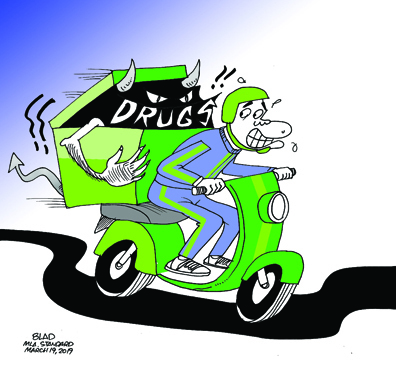 We are seeing how even an all-out war on drugs is not enough to eradicate it. Those in the trade will find newer and more ingenious ways to get around authorities. Success is not measured by the number of the dead. Authorities will have to step up their game and their imagination, using more brains than brawn, following the correct leads while sparing innocent lives.